Eva Schlegel’s work includes photographs, objects, and installations concerned with the interaction of objects and perception, especially with the contradictions und ruptures that frequently occur in this relationship. In many of her works, meaning is constructed by consciously mobilizing the potential of associations and fathoming its depth. Her engagement with concealing and revealing, disclosure and discovery investigates structures of desire and legibility immanent to the image. For her exhibition at the Secession Eva Schlegel developed a site-specific installation that takes up the parameters of the architecture in order to reinterpret them. Central elements of Eva Schlegel’s engulfing installation for the Hauptraum of the Secession are the lead wall paneling and a big mirror surface on the floor. The hermetic heavy metal insulation of the lateral walls and the reflection of the light-flooded ceiling in the mirrored floor result in an architectural redefinition of the exhibition space: The openings to the bottom and top emphasize the vertical axis. 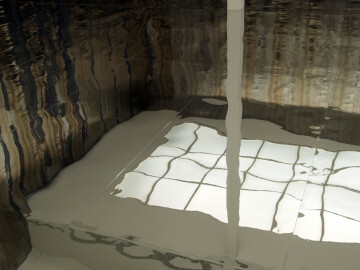 In addition, the mirrors cause a reversal of top and bottom by ripping virtual holes into the floor and dissolving it under the viewers’ feet. Eva Schlegel uses lead as an expressive medium. Its striking presence in the exhibition space draws on the seductive, iridescent surface of the soft, silver grey metal that, exposed to air, oxidizes with a lackluster bluish grey coat. 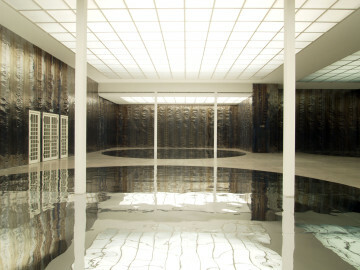 At the same time manifold metaphorical and concrete meanings are attached to this material. At all times, lead is synonymous with paralyzing weight and frozen time. In mythology it is ascribed to the planet Saturn, the time god Chronos and the topoi of melancholia; it is located on the lowest level of the hierarchy of metals. Industrial use of this heavy metal—for energy insulation, for safety containers for aggressive acids and ammunition, as well as for radiation protection and in the construction of atomic reactors—adds more, literally explosive, connotations to the traditional meaning. 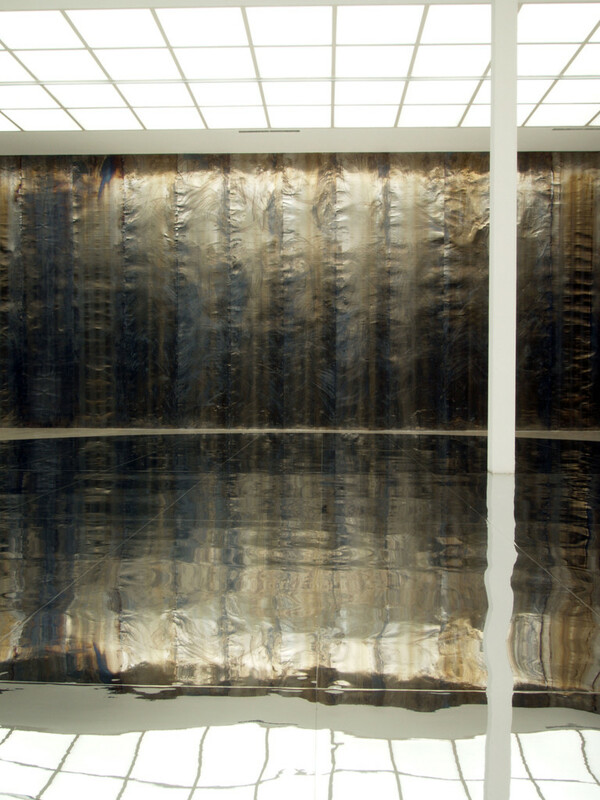 Eva Schlegel refers to the impenetrable, insulating qualities of lead, while she contrasts the dreary lining of the space with the bright weightlessness of the mirror surface and the glass ceiling. 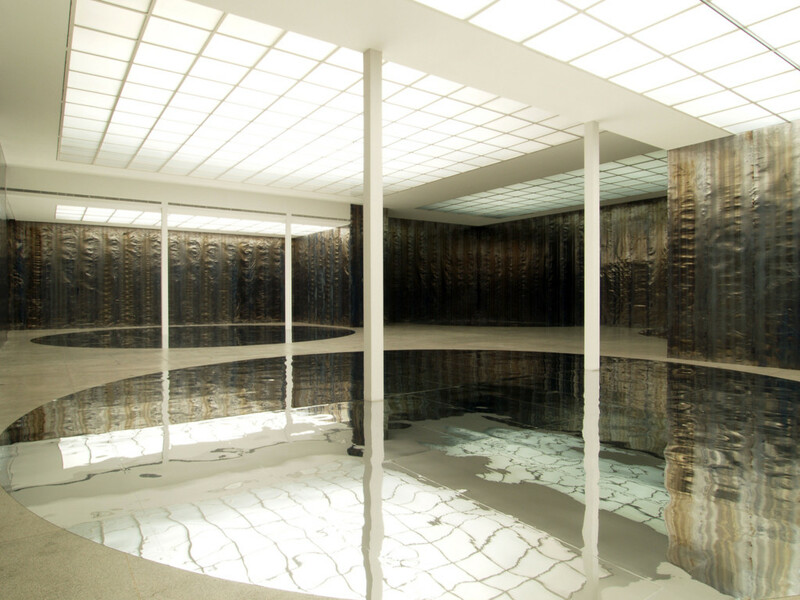 On several levels, Eva Schlegel’s installation for the Secession refers to her earlier works. 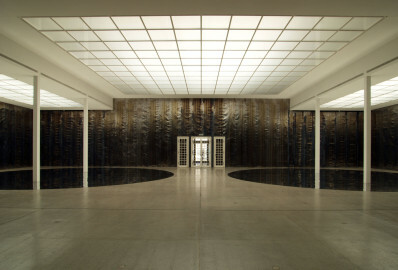 The alteration of the light situation as well as the playful interaction of transparency and opacity are central elements that already played an important role in her installations for the Galerie im Taxispalais Innsbruck (2000) and the Austrian pavilion at the Venice Biennial (1995) and are further developed in her piece for the Secession. 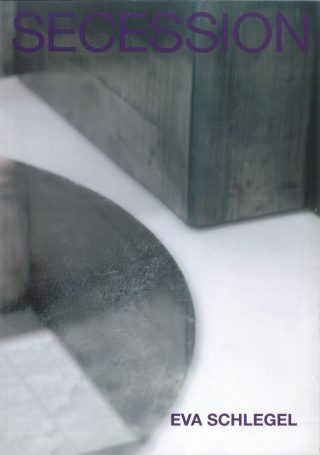 At the same time, Schlegel’s piece also reinterprets the recurrent methodological use of out of focus haziness in her photographs. On the threshold between recognition and fading away, identification and anonymity, loss and gain of information her images fathom the legibility of subject matter as well as the rules of perception. 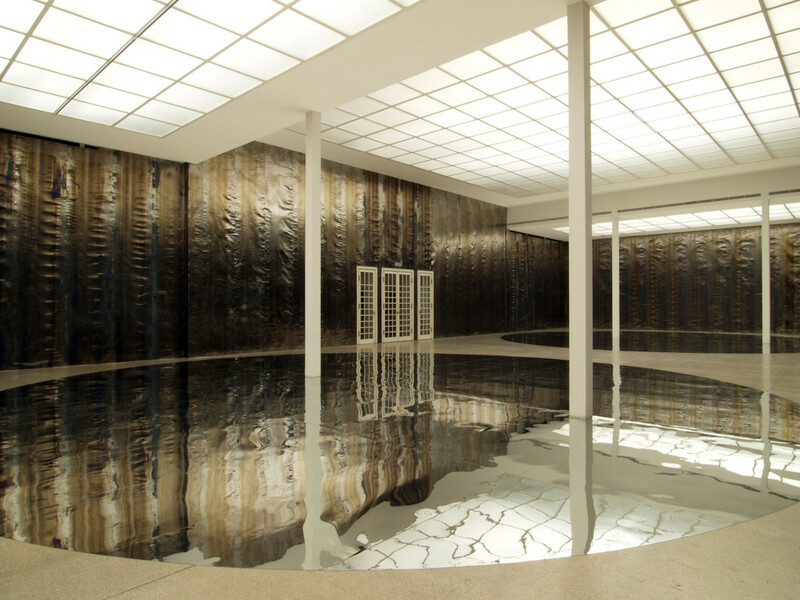 The way in which the installation integrates the viewers in numerous reflections, duplications, and shadows alters the perception of persons in the space. This can be compared to the blurred contours of the persons in the pictorial space of her photographs. Engaging with the qualities and meanings of the materials Eva Schlegel opens a space of association that directs attention to the very modes of seeing. Eva Schlegel, born in Hall / Tyrol in 1960, lives and works in Vienna.